Doppler Photo: Photos and stories by Omari Stephens: Vegas: O, Cirque de Soleil! During our trip, we had an opportunity to take in the Cirque de Soleil show "O", which used a permanent set in the Bellagio hotel. Having been to a number of traveling shows of theirs, there is absolutely no comparison; "O" blew them all away. The show was basically all about water, and the stage itself was a concentric ring of three or four moving platforms that could be lowered beneath a deep pool of water below. 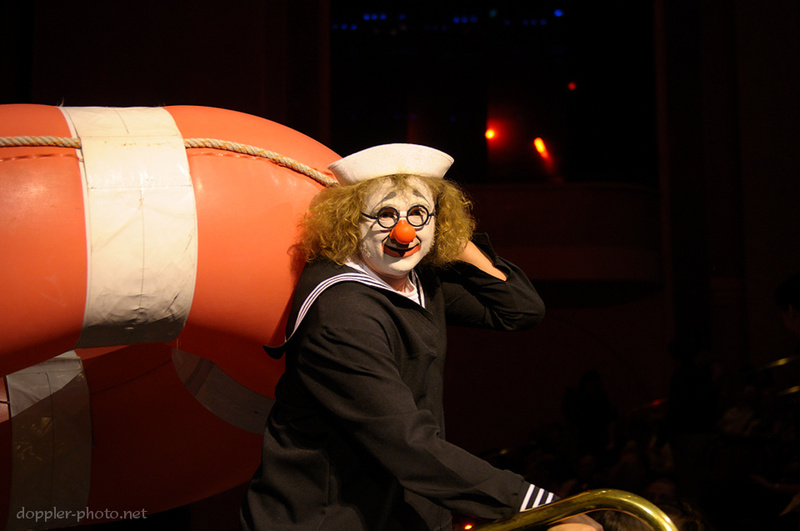 The show featured acts spreading the gamut from synchronized swimmers and fire poi spinners to trapeze artists, 10-meter platform divers, and a pair of washed-up mimes. This is one of the mimes. 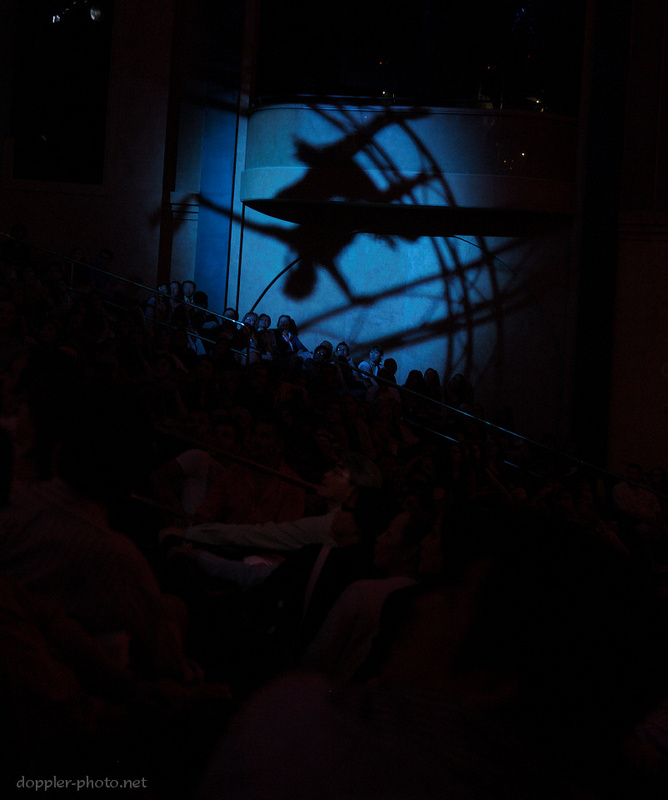 During a short slap-stick performance leading into the beginning of the actual show, the two carried this huge flotation ring around the audience area, at times squeezing through the already-packed rows of seats. On their journey, they basically tried to get audience members wet, what with a spray bottle they used to "clean" as they went, and certain spots in the theater where varying quantities of water dropped from the ceiling. Throughout the show, the lighting and sound were spot on. 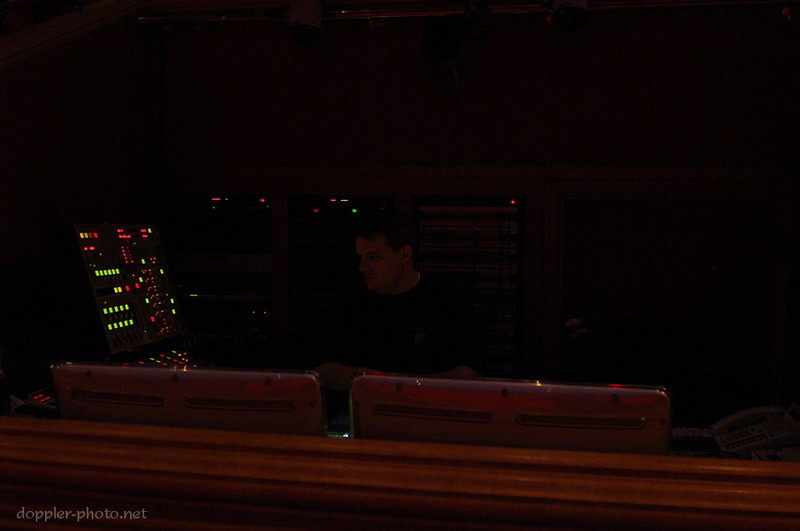 Judging by the patch-panels behind him, this guy was at least controlling the sound, if not the lights as well. The route the two mimes took lead them around and through the audience before finally depositing them on-stage. At that point, this one managed to convince us that we were an orchestra of applause and he was our conductor. After a little bit of this game, he picked up his slightly ineffective umbrella, deflected a deluge of water at the crowd, and exited the stage. 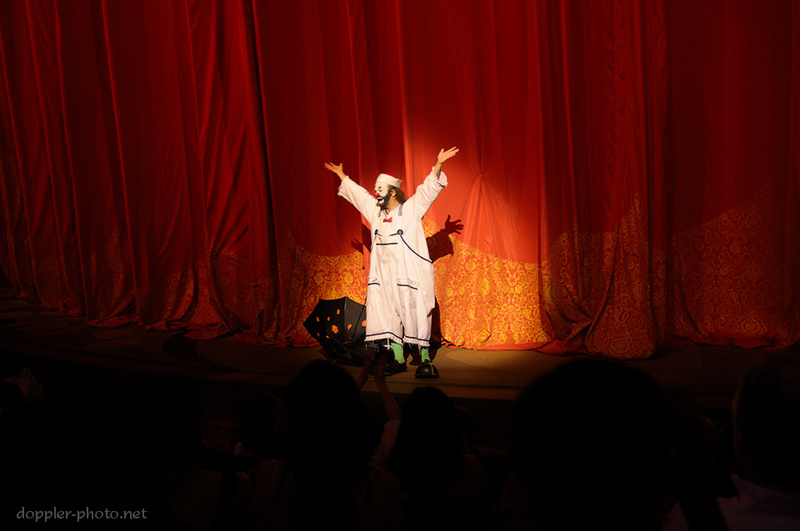 After the mimes' skit, the plot of the show began, at which point they asked us to stop taking photos. A woman descended from the sky dropped a fluttery handkerchief on the ground, and the show began.